Comments: Evergreen broadleaf native to China but cultivated early in Japan and elsewhere. Has large dark green lanceolate leaves, creamy flowers and yellow fruit. Leaf has prominent veins and the underside is brown and furry. Fruit taste is somewhat like an apricot. Fruit has large seeds which easily separate from the fruit's flesh. 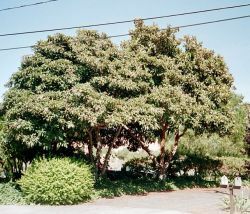 Large bush to small tree with height somewhere around 25' max. There are numerous cultivars of this plant.